My long-time friend Doug Greener went to Sierra Leone with me and some other American college students back in 1963, as part of a workcamp project, Operation Crossroads Africa. He lives in Israel now, and I thought this blog post he did there was a great example of the pleasure you can get from simple living. By the way, he also has a beer blog. A few months ago, I found a baby turtle walking on a stone path behind our apartment building. He was very small, about as round as a silver dollar, and I have no idea how he reached that path. All around us are streets and roads and it would have taken a miracle for the little turtle to have crossed one of them unhurt from an adjacent park or woodland. Or maybe he was born right in our own backyard. I kept him in the box a few days and he seemed okay. I put in a little rag that he could crawl under in the nighttime or whenever he wanted, fed him lettuce and put his box in the sun every day. Then, on a cloudy day, I took the little turtle and walked into the Mir Forest which juts into my Pisgat Ze’ev neighborhood. Developers have been taking chunks out of the Mir Forest to build new apartment blocks, but it still has enough breadth to be home for hedgehogs, turtles, hyraxes and other small animals. Sometimes as occasional deer will come in from the adjacent Judean Hills. But on this day, the winter rains hadn’t yet begun and the entire ground was dry and brown. Not a hint of green anywhere. How could I leave the little turtle here where there was nothing for him to eat? Together we walked into the forest and together we walked back home. I decided to keep him until the rains came and the forest floor turned green. But keeping a little turtle alive and well in captivity for a longer time demanded more information. So I took to the internet to get it. Instead of a cardboard box, I got a shallow aluminum tray into which I put a layer of earth. I built a little cardboard house with two openings, because I read that turtles like to go under some protection for the night. I put the little turtle in and he seemed very happy in his new home environment. I was reminded that it was only temporary when the little turtle tried to climb over the tray walls, getting as high as he could on his hind legs. His real home was not here — as luxurious as I may make it — but back in nature. In the meantime, though, he had to be kept alive and well. I learned from my research that this little one was probably a Mediterranean tortoise, or some close relative. They’re quite common throughout Israel, in most of the Middle East, and in fact around the entire Mediterranean area. Children and families often find them while hiking in fields or wooded areas, and can’t resist bringing them home, putting them in a cardboard box and feeding them lettuce and who knows what else. If you release them back into nature after a few days, no harm done. But I learned that keeping them in the box longer than that is horrible torture. Removed from their natural habitat, diet and sunshine, they will soon die of disease or malnutrition. Even though I knew that the little turtle’s stay with me would be limited, I did what I could to recreate and provide all the things he needed to survive in good health. Mediterranean tortoises are 100% herbivores. They need no additions or substitutes for the grasses and plants that grow in their territory. “Human” vegetables like lettuce and cucumbers and tomatoes are not their natural diet, and lack the vitamins and roughage they need. Worst of all is commercial “turtle food.” This provides very little of the nutrients they really need. It’s also too high in protein, which can cause turtles to develop grotesque shell deformities. They get all the protein they need in the plants and grasses around them. The same goes for calcium. Turtles, especially juveniles, need this for strong shells and bones. They get this in the plants they eat, which absorb calcium from the soil. Also important is Vitamin D which enable turtles, and us, to absorb the calcium into their bodies. Turtles, like us, get Vitamin D from the sun, which is one of the reasons they like to spend so much time basking in it. The experts on the internet recommend that turtles in captivity be given supplements of calcium and Vitamin D. I did this by dissolving the supplements (Vitamin D drops and grated calcium tablets) into a small bowl of shallow water and putting the little turtle into it. I did it for a few minutes every three days or so, which was probably more than enough. When he naturally opened up his mouth to drink, he ingested the vitamin and mineral as well. No less important for the little turtle was drinking the water. Mediterranean tortoises need to stay hydrated. During the dry summer months, they seem to get all the moisture they need from the scant vegetation they find on the ground. Their bodies adjust for this. But during the rainy winter months, they will actually drink from puddles they come across. 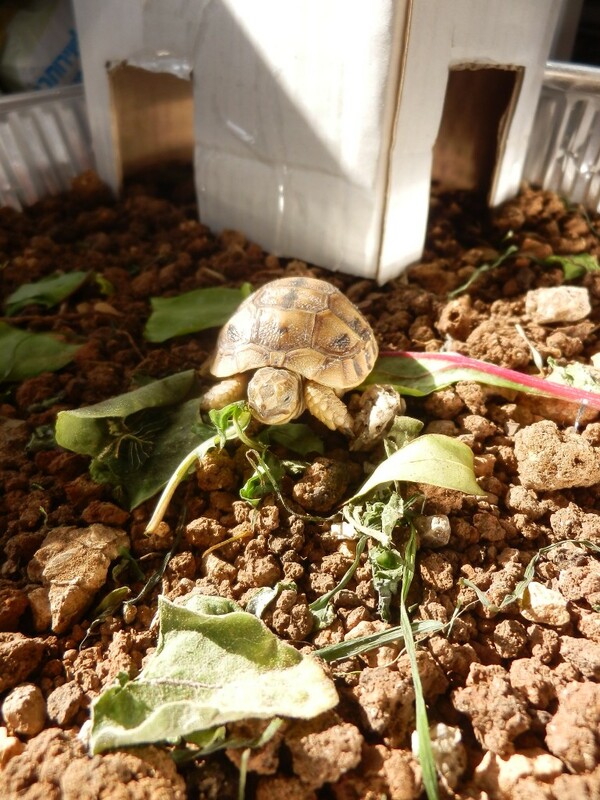 Every morning I picked some of the plants and grasses that were growing around my house, since these were the little turtle’s natural food, and put them in his earth-filled tray. I’m sure passers-by who saw me picking grass and leaves from empty lots and around trees along the street had no idea what I was doing. Maybe they thought I was a super health nut who made salads from all kinds of inedible wild plants! The little turtle, though, seemed to be thriving with his fresh vegetation, direct sunlight (not through glass) and enriched water. Turtles, as you probably know, do everything slowly, including eating. My little turtle didn’t exactly run to gobble down the grasses when I sprinkled them in his tray. In fact, it was only on rare occasions that I actually observed him eating. Sometimes I would get nervous about it and slipped him a piece of lettuce. This he did go to eat, perhaps preferring the taste and texture of domesticated “people food.” It gave me great pleasure to see him eating with such a good appetite. But I knew that this was not the best for him, so I kept these “treats” very infrequent. The little turtle was with me for a couple of months and appeared happy and healthy. But he never stopped trying to climb out of the tray. He did not want to be a happy captive. In the meantime, the fall rains did begin and the dry, brown earth took on a bright green and soft blanket. The time had come to release the little turtle back into nature. We chose a morning when our two grandsons were visiting us. After we explained that the little turtle, like all wild animals, wanted nothing more than to live free in nature, the boys were solidly on board, as excited as we were. We put the little turtle in plastic box, with some grass inside for a traveling snack, and descended once again into the Mir Forest. This time, the forest floor was glowing with green. We walked deeper into the woods; the outer perimeter was too close to cars, people and pets. We found a quiet, clover-filled clearing, and there, with great ceremony, we released the little turtle. As we watched, he spent a few minutes acclimating himself and then started chomping on a sprig of clover: his first meal in freedom since I found him. “You saw that he can find his own food,” I answered, “and he’ll be happy crawling underneath a log or some leaves when it get dark and cold — or he can just pull in his head and legs and be safe inside his shell. “He’ll do what all turtles have known how to do for three million years.” I was going to add, “And the good Lord will look out for him as He does for all creatures,” but thought better of it. That was not the language they were used to hearing at home. What I didn’t tell them was that the little turtle has now joined the struggle for survival that all free creatures must wage. He’ll know cold, stormy nights and days when his body almost stops functioning; hunger, thirst and the broiling sun when summer appears; sudden danger from wild animals, dogs, vehicles and human hikers. Yet, if he could answer our question, I don’t believe he would consider for a moment going back into safe captivity. He is a free turtle in a place he knows is his home. Dangers around every corner, no guarantees, no one else looking out for him — but a good place to be.